Not Art, not education is: an exhibition, a public program, a laboratory, an atelier, a working space. And many more things. 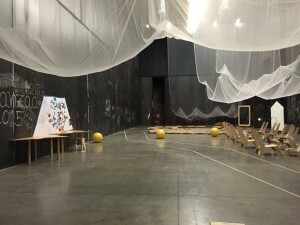 The exhibition was curated by “Educación Disruptiva. Grupo de Pensamiento de Matadero Madrid”. It is happening in two halls, that formerly were part of abattoirs and is now a respectable, actually a showcase cultural centre: Matadero Madrid. The two halls are divided: One room is more likely to be used as a room for activities. The walls can be inscribed with chalk, there are books (mainly on art education), chairs, a hammock, tables, gymnastic balls. The other hall hosts several works, by e.g. la agencia, meCHive, núbol, Jordi Ferreiro. Check the weekly program!There are at least one, if not activites day by day. It actually is not art, not education. But it is a festival of current artistic and educational projects. 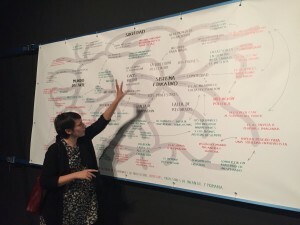 Clara Megías explains the research on teaching/learning art (la brecha) by the collective núbol.